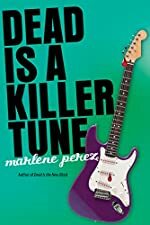 Dead is a Killer Tune by Marlene Perez. A Dead Is Book. Review: Marlene Perez has seven books in the Dead IsÉ series. Here they are: Dead is a Killer Tune, Dead is the New Black, Dead is a State of Mind, Dead is So Last Year, Dead is Just a Rumor, Dead is Not an Option, and Dead is a Battlefield. Her latest book Dead is a Killer Tune does not disappoint dedicated Dead Is É series fans. Jessica Walsh is a freshman in High School. She is also a virago, a woman warrior who must protect her town from danger. In the small town of Nightshade, California, trouble is always coming their way. At Nightshade's Battle of the Bands, Jessica's boyfriend, Dominick, and his band, Side Effects May Vary, are playing against Hamelin, a band whose fans go everywhere that they go. Now the musicians are doing illegal, risky, and really dumb things. They say that they do this because of strange music that they hear. Could there be a magical musician? It's up to Jessica to find out. I really liked this book. It was a quick read. I could always tell what was going to happen next. There was also action, which I love! Also, it's a magic and adventure story. I would give it a nine out of ten for great humor, a great story, and great characters. I would recommend this book for kids 10 and up. I hope you read this book! We would like to thank Houghton Mifflin Harcourt for providing a copy of Dead is a Killer Tune for this review. Have you read Dead is a Killer Tune? How would you rate it?